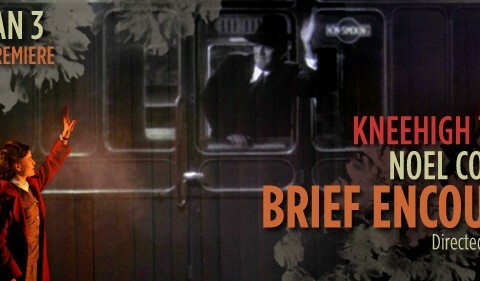 Noël Coward’s Brief Encounter makes its New York Premiere in this seven-week run at St. Ann’s Warehouse. The show is an adaptation of the 1946 film of the same name, directed by David Lean, and based on Still Life, a Noël Coward one-act first seen a decade earlier. Kneehigh’s Artistic Director Emma Rice has returned to Coward’s original play to rediscover elements that were discarded from the legendary film script. Switching seamlessly between live theater and remade film footage, Brief Encounter takes audiences back to a bygone age of romance and the silver screen. The production careens around varying moods of clipped, clenched passion heaving under the middle-class restraint of the duty-bound Alec and Laura, and the wild music-hall exuberance of the ­slap-and-tickle highjinks of two other clandestine couples among the railway station staff. The lives and loves of the three couples are played out in the train station tearoom as a grand entertainment, using the words (some newly set to original music) and familiar songs of Noël Coward to create a breathtaking, funny and tear-inducing show with live musicians on stage, characters jumping in and out of film screens, and a couple in love floating in mid-air. Originally produced by David Pugh & Dafydd Rogers and Cineworld. Captivating… I felt enlivened, enlightened and seriously moved­. A charming meditation on that dangerous phenomenon called love­. The most blissfully entertaining and inventive show in town­. Just go and let the considerable enchantment of [Emma Rice’s] ingenuity wash over you­­.